If I were being completely honest here, I would tell you about how many times I’ve tried to place our stroller to the buggy return at Target. And about the time I actually did, then got back in my car before realizing what I’d done. I’d also tell you about how I got soaked in spit up during a middle of the night feeding, thought about showering it off, but decided to just let it air dry and get back in bed. But I’m not going to be completely honest because it’s a dreary Monday, and I have Vanilla Coke Zero to drink. The littlest lady and I are both down for the count thanks to a very solid cold in the throat, head and nose. I can assure you that you do not know the definition of pitiful until you hear a 9-week old baby puddleduck girl try to coo with a hoarse voice. Being back at the office last week undoubtedly played conductor to this swarming symphony of germs, and while Nora Bethy Bethy Beth is able to feast upon my immunoglobulins at each feeding, I am feasting upon Neti rinses and Tylenol Severe Cold. Huzzah! I always thought that moms never got sick, because nowhere in the furthest nooks and crannies of my memories can I remember my mom ever being under the weather (save for that time she broke her ribs coughing), like, ever. Now I know that it isn’t that they don’t, it’s that it just doesn’t matter when they do. And I feel very lucky to be the mom now. Sore throat and all. Jerk Chicken Stuffed Sweet Potatoes – A personal favorite of mine, these sweet potatoes are a balance of sweet, savory, hearty and light. And they reheat fabulously. Beef + Blue Cheese Sliders – I set this beef to cook all day Saturday and shredded it Saturday night. After church on Sunday I assembled the sliders. We love these and will probably make them often. I did find myself out of mayonnaise at the last minute (come again?!) and used sour cream in its place, which made a lovely substitute. Rice + Bean Casserole – This is on the list because it is a C.H.E.A.P. meal. Luckily it’s pretty dang tasty too. We’ll serve ours alongside some smoked sausage. 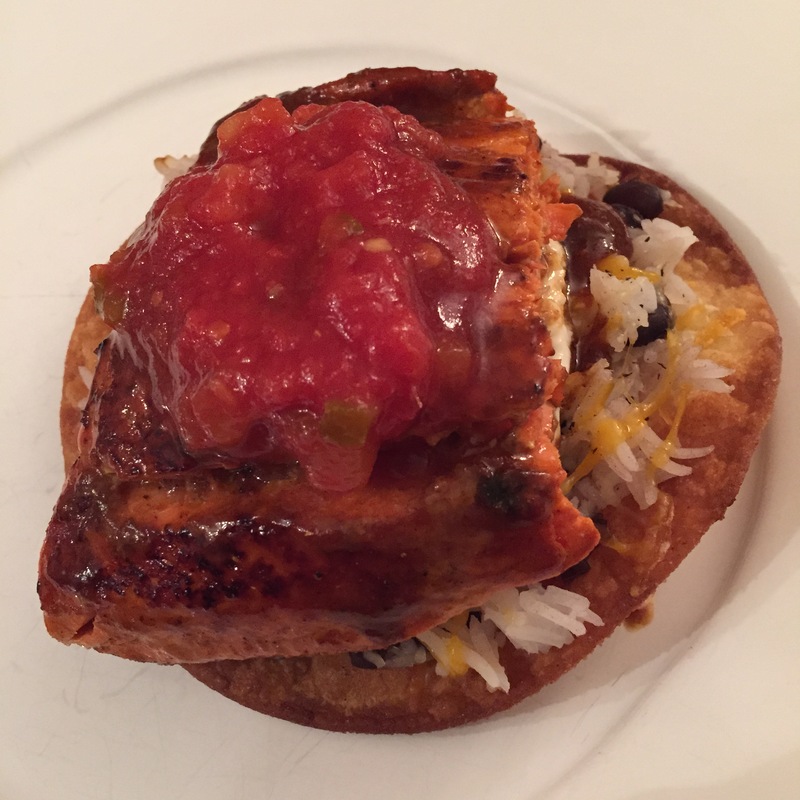 Caribbean Salmon Tostadas (pictured) – This was Saturday night’s dinner. And while it is not a hard dish to make, it does require some time and lots of dishes. For convenience I picked up a jar of pineapple and peach salsa at Target and skipped the coconut rice in favor of regular. The end result was so tasty, and I know I’ll make this again one day. Melt-In-Your-Mouth Chicken Pie – Another el cheapo dish, this casserole is simple and straight up comfort food. Which you would know just by reading that the ingredients are basically flour and cream of chicken soup.